Use the keys to start and stop the engine, and to lock and unlock all the doors, trunk, and fuel fill door. 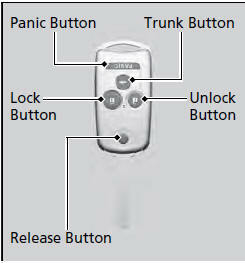 You can also use the remote transmitter to lock and unlock the doors, trunk, and fuel fill door. The seat automatically moves to the preset position when you unlock the door using the remote transmitter on the master key. The master key folds up inside the remote transmitter. 1. Press the release button to release the key out from the transmitter. - Make sure to fully extend the key. 2. 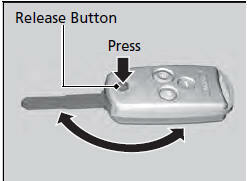 To close the key, press the release button then push the key inside the transmitter until you hear a click.